This year my school decided to implement Professional Learning Communities, focusing on the Reading Apprenticeship model, in addition to using the Collins Writing program that was initiated last year. We have also been encouraged to be the “guide on the side” and have more student centered or directed learning taking place in our classrooms. With all of this in mind, my mission was to develop a couple of activities to try out the concepts in my child development class. A friend had just shared the Parenting magazine article on Hidden Hazards with me and it seemed like it would be a good fit. I’m glad to say I had very engaged students who were sharing, brainstorming, using technology and writing! Mission accomplished! Have the Mission Impossible theme song playing in the background as students enter the room. Inform them that their mission for today, if they choose to accept it (which they will) is to discover the top ten hidden hazards found in the home. Ask student to individually fill in the first column of their Hidden Hazards chart with what they think are the top ten. Then have them do a partner share. I like to randomly group my students, but you can have them just turn to their neighbor to keep it simple. After sharing their lists with one another, they write down their partner’s list. Circle duplicate answers. Together they create a new top ten list. They use their duplicate answers and then they have discuss and agree on the remaining dangers. Next, I show them an Animoto I created of the actual Top 10 Hidden Hazards and they write these down in the fourth column as they are viewing it. Individually or with their partner they briefly brainstorm why they believe the object is dangerous in the provided column. Finally, students use the link to the actual Parents Magazine article, found here, to read exactly why the object is dangerous. Students add to their answer in the final column if it’s not complete or they can draw a star if the answer is spot on. Finally, I have students complete a 3-2-1 Exit Slip based on all of this information. 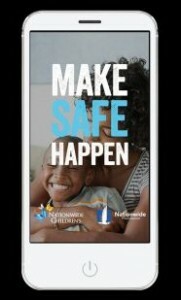 As students enter the room, I have them begin the download of the free App: Make Safe Happen. While exploring, students fill out the App Exploration & Evaluation form. See below. After students finish exploring the site and complete the first two sections of the App form, they conclude with the responsive writing section which asks them to compare the information from the App to the information from the Hidden Hazards article and finally, asks if this would be something they would use as future parents are not and why.